How to borrow archival materials and oral history interviews for exhibitions. If a document is owned by the Archives of American Art, it may be available for loan. Some documents may have donor restrictions and additional permission may be required for the exhibition. In addition, the condition of a document must be appraised by the Registrar before final approval of any loan. Any institution wishing to borrow original documents for exhibition must provide the Registrar with a facilities report for all venues, prior to final approval. All documents must be insured with all-risk, wall-to-wall coverage. Contact the Registrar at least three months prior to the date of the planned exhibition. The Director of the Archives of American Art must approve all initial requests. 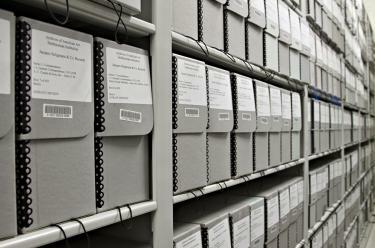 Please note that the Archives does charge a loan fee for documents borrowed. This fee does not include or cover the cost of shipping, insurance, or reproduction; other fees may also apply. Questions? Contact the Registrar via e-mail at CaryS@si.edu or call 202-633-7945.